With a Carbon Heat Warm Water Under Floor Heating System, you can experience the difference, safe in the knowledge that you have a system of the highest European quality, designed especially for your home or premises. Our warm water based systems are suitable for all types of project and in all types of property, whether domestic or commercial. From thousands of square meters down to the smallest conservatory, kitchen, dining room, living room or bathroom we can supply a cost effective solution thats perfect for your room. In fact we have fitted entire houses and commercial premises with water underfloor heating on many occassions. We provide a full CAD-Design service so the system is designed specifically for your room measurements and shape - this means you will receive a complete professional installation design service custom geared to your needs. You can even view our designs for your room before we start installing the heating system. A digital heat mister thermostat is also included giving you the ultimate control of your floor heating system every minute of every day. With the heat mister thermostat you can create specific heating plans for varied temperatures at different hours, days, weeks, months and seasons of the year making heating your home that much easier and enjoyable. Suitable to use with virtually all types of floor finish and construction. Easily used with radiators and towel rails. Compatible for all types of boiler. Easily linked to commercial BMS systems. Can be used with geothermal and solar assisted heating services. The water based systems use the highest quality components, chosen not just for their long-term reliability and durability, but also for their simplicity. We match these with bespoke design, uncomplicated floor constructions and no fuss installation techniques. Choosing Carbon Heat ensures you get a system that heats your home or commercial premises efficiently and effectively, the system has a long life, is virtually maintenance free, and is quick and simple to install. Our components and systems are manufactured and designed to meet all European & UK standards, including ISO9001 and DIN4726. 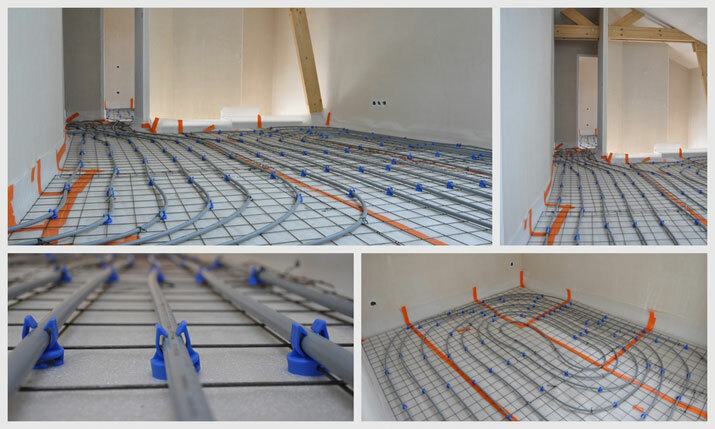 If you are considering having warm water based underfloor heating installed in your home or commercial premises why not contact us and let us take you through the process one step at a time.